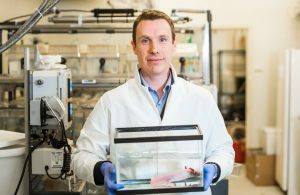 BAR HARBOR, MAINE — The answer to regenerative medicine’s most compelling question — why some organisms can regenerate major body parts such as hearts and limbs while others, such as humans, cannot — may lie with the body’s innate immune system, according to a new study of heart regeneration in the axolotl, or Mexican salamander, an organism that takes the prize as nature’s champion of regeneration. The study, which was conducted by James Godwin, Ph.D., of the MDI Biological Laboratory in Bar Harbor, Maine, found that the formation of new heart muscle tissue in the adult axolotl after an artificially induced heart attack is dependent on the presence of macrophages, a type of white blood cell. When macrophages were depleted, the salamanders formed permanent scar tissue that blocked regeneration. Godwin, who is an immunologist, originally chose to look at the function of the immune system in regeneration because its role as the equivalent of a first responder at the site of an injury means that it is responsible for preparing the ground for tissue repairs. The recent study was a follow-up to an earlier study which found that macrophages also play a critical role in limb regeneration. Godwin holds a dual appointment with The Jackson Laboratory, also located in Bar Harbor, which is focused on the mouse as a model animal. The dual appointment allows him to conduct experiments that compare genetic programming in the highly regenerative animals used as models at the MDI Biological Laboratory with genetic programming in neonatal and adult mice.